The seafood hot mess with chermoula fries at Vancouver’s Oddfish Restaurant. 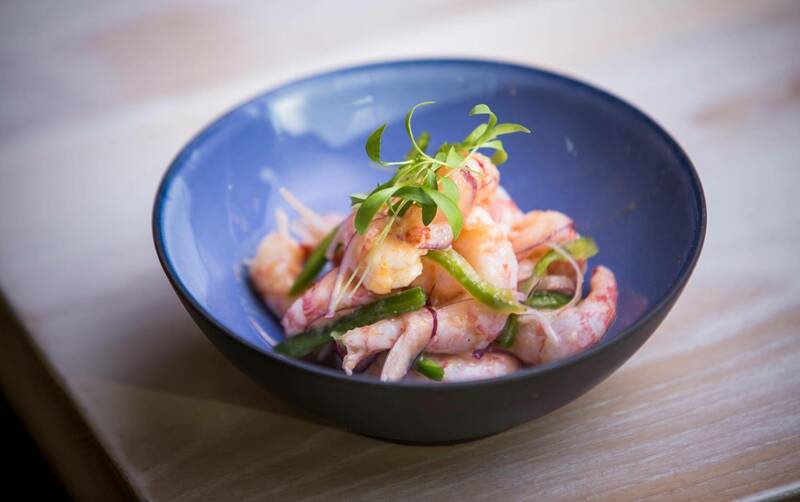 The seafood hot mess at Oddfish Restaurant is exactly that – a huge heap of finfish, mollusks and crustaceans straight off the sizzling plancha grill, piled high on a platter with rough-chopped salsa verde poured over top. There is spicy squid cut in wide chewy rings, fat scallops encased in golden crust and plump prawns doubled over at the seams with blackened bits of char tangled in their translucent-pink tails. About a dozen clams and mussels are popped open, the shells pooled with white wine, after two minutes under a cloche steamer. A floppy filet of crispy-skinned trout is laid over top, striped-seared-belly side down. A half-lobster sliced down the centre, its meaty claw ripe for cracking, juts over the side like a jaunty hand wave. Take the charred lemon wedge and squeeze it over everything. Dig in with your fingers, if you like. No need for a bib. (It's messy, but civilized.) Don't forget to order a baguette or, better yet, a side of thick, crunchy, knife-cut fries. You'll need one or the other for dipping in the simple salsa verde (just parsley, chili, lemon, olive oil and capers), which dribbles down into a rich slick at the bottom of the platter. Fresh, easy, lightly treated, generously portioned, fairly priced, more robust than a boil, less precious than a chilled tower – this is the way seafood should always be eaten, at least in my mind. This is the way you will find it served in any port city anywhere in the world (with slight variations in dressings, of course). Except in Vancouver, that is, until right here and now. Oddfish Chef Tristan Chisholm prepares fish on a plancha griddle. Oddfish Restaurant is not a stunning beauty with glorious ocean views. The chalkboard menu is limited. The cooking is pretty straightforward. But when it comes down to pure satisfaction on the plate, there is nowhere else I'd rather go out for seafood. Oddly enough, it really is a singular seafood experience. I must admit that I'm not totally surprised. Mike Jeffs, Nicole Welsh and their merry band of misfits have been nailing the casual neighbourhood restaurant formula (without ever becoming formulaic) since they opened Tapastree in the late nineties. Tavola, which replaced Tapastree in 2010, and Nook restaurants (West End, Kitsilano and a third coming soon to Olympic Village) offer some of the best, unfussy, underrated Italian cooking in the city. Their fans have obviously followed them. Even on a quiet Sunday night and torrentially wet Monday, the place is packed, the vibe bustling and lively. The patio was enclosed earlier this week, expanding the winter seating capacity. So at least now it might be easier to secure a reservation. The pale-wood-panelled, tightly squeezed dining room doesn't exactly scream "seafood restaurant." There is a hand-painted mural of octopus and jellyfish floating around the open kitchen, but it plays second fiddle to the more dominant chalkboard menu. And I suppose that the green-velour upholstery could be considered "seaweed" hued if you really stretch your imagination. The bulk of Oddfish’s menu comes from a daily changing chalkboard selection. While I appreciate that the decor isn't clichéd, there is something about it that feels unfinished. Mind you, I felt the same way about Tavola when it first opened. It took a few years to fill in around the edges and develop a lived-in patina. And now I love that restaurant, so go figure. The bar, on the other hand, had me from the first glass of fizzy, red Lambrusco. Who serves Lambrusco by the glass? Many more if I had my way. The wine list is full of idiosyncratic deliciousness. I suggest you start with side-stripe shrimp ceviche, tautly fleshed and tartly marinated in leche de tigre lime juice fortified with thickly sliced red onions and green peppers. You wouldn't go wrong with whole seabass, charred crisp on the flattop, sliced down its flaky middle and smothered with cilantro and red onions dressed in good olive oil and lemon juice. But if you only go once, definitely do the scrumptious seafood hot mess. The cauliflower is served like a steak in one big, browned head. As a side, you will probably want to order cauliflower, which is served like a steak in one big, browned head drizzled with spicy green chermoula and tart pomegranate molasses. For dessert, densely moist olive cake with brown-buttered plums and hefty chocolate mousse covered in a crackled praline and pistachio crust are both exceptionally satisfying. And that's about as far as I can guide you. The bulk of the menu comes from a daily changing chalkboard selection, as it should. There might be spring salmon with chanterelles, halibut crusted in thinly sliced potatoes or sole drowned in lemon-butter piccata. I didn't eat widely over two visits because the portions were so plentiful. But everything I tasted was terrific and treated with the same light touch – fresh fish on a hot grill with a squeeze of lemon, sprinkling of herbs and glug of good olive oil. What more do you want? Personally, I'd like one of these in every neighbourhood. Maybe then it would be more commonplace than odd.